On the advice of a friend from the fabulous Milos’ Craft Beer Emporium, the Clockwatching Tart and I decided to check out Arabella Park Beer Bar in nearby Kitchener, Ontario. 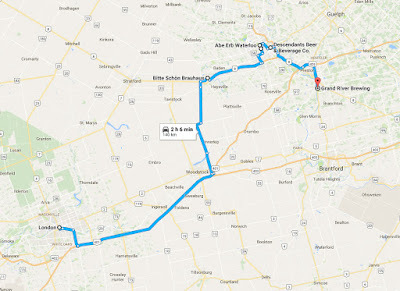 Rather than just blasting down the 401 and making a quick trip of it, we fired up our faithful Subaru and took to the country roads in search of food, drink and adventure. Being the crafty Google Maps user, researcher and spreadsheet planner she is, the Clockwatching Tart planned a route taking us to breweries and bars both new and familiar and in the process created a route I’ve christened “The Big Dipper”. 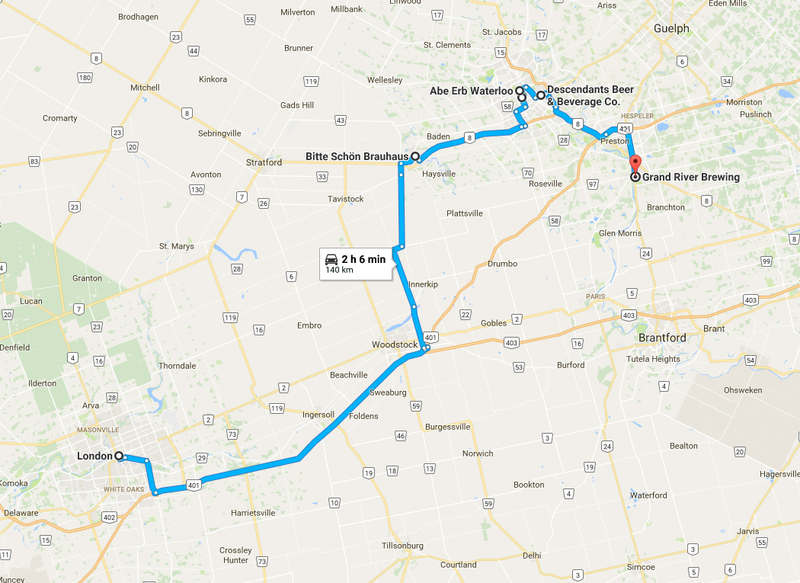 Basically a smaller version of the Waterloo Region Craft Ale Trail with some local sights thrown in for good measure, The Big Dipper started off with the Bitte Schön Brauhaus, a lovely little microbrewery in the comically lovely little hamlet of New Hamburg. Bitte Schön was small but inviting with a nice set up and friendly staff. Having never tried their beer, we settled on a flight of four tasters and were impressed with their Alder Creek Altbier (which was dark and smooth and had kind of a lightly spiced caramel apple thing going on) and their Huron Street Hefeweizen (which was light and floral with wonderful citrus notes). We picked up some to share with friends and continued on our merry way. Our next stop was one of those pleasant surprises that happens when you are out exploring. We noticed a park as we were crossing the bridge into New Hamburg so we went to check it out. Not only did we discover a stone pathway across the Nith River in Scott Park, we also stumbled upon the New Hamburg Heritage Waterwheel. Billed as the largest working waterwheel in North America and built in 1990, the waterwheel was awesome to see and made the day all the more special. Next up was Arabella Park Beer Bar for lunch. With 18 taps primarily focused on regional craft beers and ciders, an impressive bottle list and locally sourced food rooted in Canadian cuisine, Arabella Park was perfect for us. The Clockwatching Tart and I both found something unique to try from their tap list, with Revel Violent Delights (a spontaneously fermented cider with cherries and vanilla from the always wonderful Revel Cider Co.) and Left Field Brewery’s Lolly Mango Lassi IPA (a cloudy, creamy IPA brewed with mango, lactose sugar, cardamom and bright, citrus-forward hops). And the Clockwatching Tart had fish and chips with a funky Vermont cider. The service, drinks and food were all fantastic, so I suppose the moral of the story is that when someone from Milos’ Craft Beer Emporium recommends a place, do yourself a favour and go. Next up was Abe Erb Brewing Company, a more traditional looking dark wood and brass brewpub that was a nice place to get out of the summer heat. I had a Canada Day IPA with a nice balance of Red X malt and Citra and Centennial hops. A great folk band! Specifically, Onion Honey, who were having a CD-release party and were absolutely fantastic, talented and fun; so much so that we bought their CD to listen to on the drive home, making for a wonderful end to a wonderful day. P.S. There is also a shuffleboard table at Grand River Brewing, in case you like things that are awesome.